Charles Reed Bishop honored at Kamehameha Schools, 1946. Long live the Bernice Pauahi Bishop Museum! 1892. President Hosmer and the boarders of Oahu College paid a visit to the Bernice Pauahi Bishop Museum at the Kamehameha School last Saturday afternoon. Prof. W. T. Brigham, curator, showed the collegians almost every article on exhibit at the museum, and his visitors were very much impressed with the relics of the barbaric age of Hawaii nei, only one hundred years ago. Mr. Brigham knows the history of almost everything placed in the museum, and he entertained the students for over two hours with the pedigree of the various exhibits. The Pacific Commercial Advertiser, Volume XVI, Number 3203, Page 3. October 17, 1892. 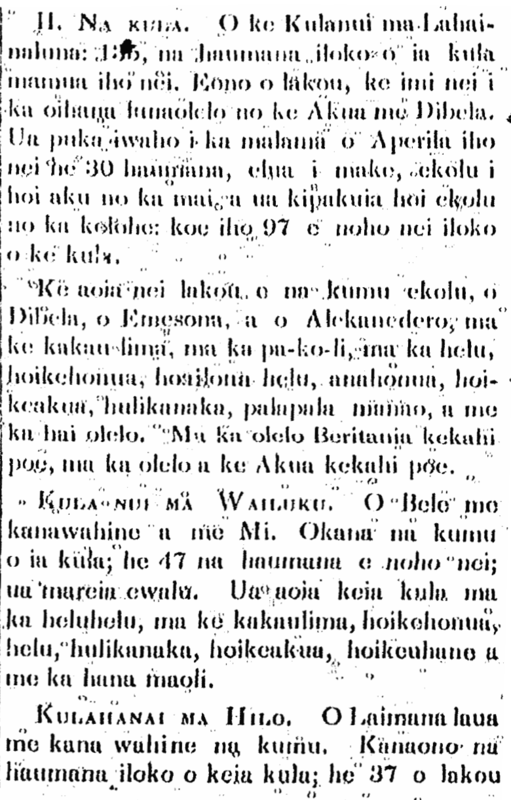 The importance of mele, 1860. O PEOPLE THAT KNOW FINE MELE AND the old Mele, I want you all to send those Mele in, and some will be published in the Hae [Ka Hae Hawaii]; and some will be kept; for those things are valuable. The Philomathian Society [?? Ahahui ma na mea naauao] at Punahou is wanting old Mele to put into their archives to be looked at at a later date. S. C. Armstrong [S. C. Limaikaika]. Ka Hae Hawaii, Buke 4, Ano Hou.—Helu 51, Aoao 203. Maraki 21, 1860. Punahou High School football team, 1907. 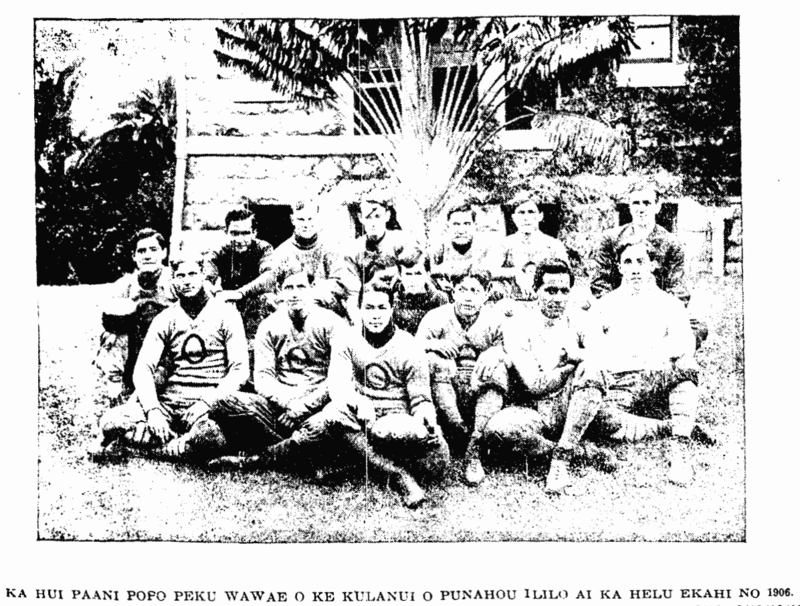 PUNAHOU HIGH SCHOOL’S FOOTBALL TEAM WHICH TOOK THE CHAMPIONSHIP OF 1906. Ka Nupepa Kuokoa, Buke XLVI, Helu 1, Aoao 7. Ianuari 4, 1907. Opening of Punahou School, 1842. THE SCHOOL AT KA PUNAHOU. On the 11th of this July, this school began; there were 5 boarders and 12 day schoolers. Its work is currently progressing well. On the 12th of July, Emerson folks left for Lahainaluna to live. Ka Nonanona, Buke 2, Pepa 4, Aoao 16. Iulai 19, 1842.